This article will provide a better working knowledge of car audio components and outline how to successfully install them. First, under the hood of your vehicle, disconnect the cable from the Negative (-) terminal of the battery. This will prevent any accidental short circuits from happening while installing your amplifier. 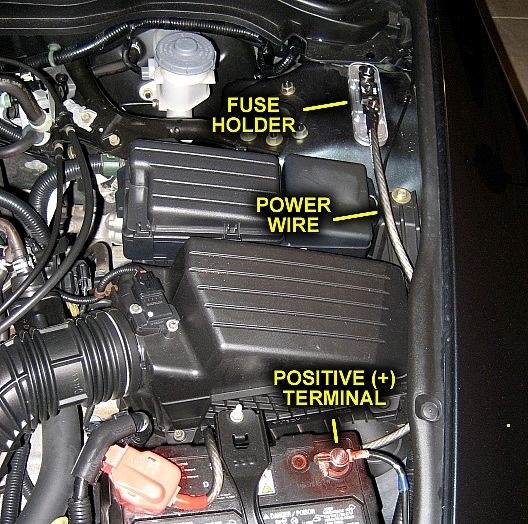 Locate an area under the hood where you can mount your fuse holder. Be sure to find an area that is as close to the battery as possible since the fuse can only protect against a short circuit if the fuse is within the short circuit. Once you have located an area, drill and screw your fuse holder in place. From inside the car, locate an area, preferably an existing protective rubber grommet, that will provide an easy pass through the firewall and under the hood. 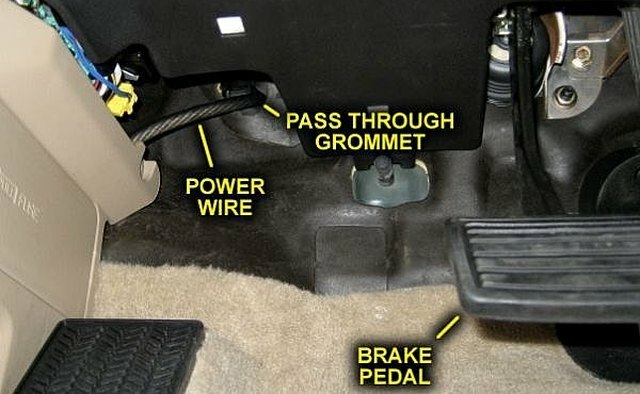 The image to the left shows an example of an existing rubber grommet that provided access from inside the car to the area under the hood. Once you have located this grommet, try pushing the power wire through it from inside the car. If you are unable to do so, puncture the grommet a couple of times with a screwdriver and try pushing the power wire through again. 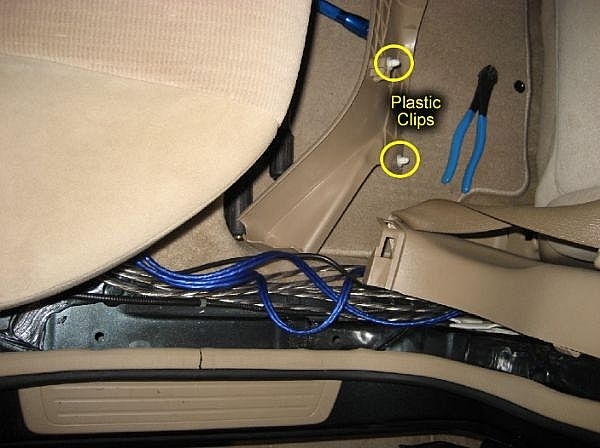 Once you have pushed the power wire through the grommet, find the power wire under the hood and pull enough slack to connect the wire to the fuse holder. At this point, you may place the fuse in the fuse holder and attach the power wire that has been fed through the firewall to the fuse holder. You may also connect a short power wire from the positive terminal of the battery to the other side of your fuse holder. 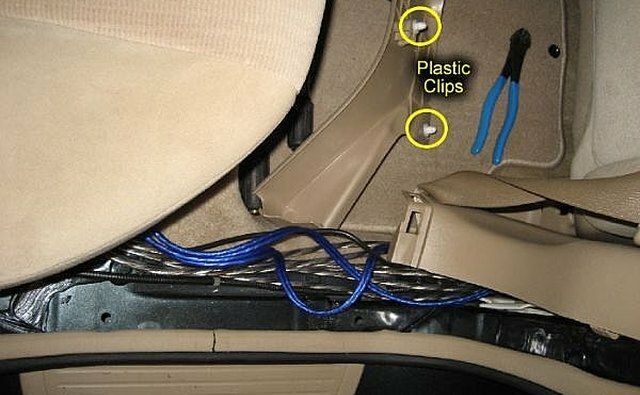 Route your power wire through the car and into the trunk. 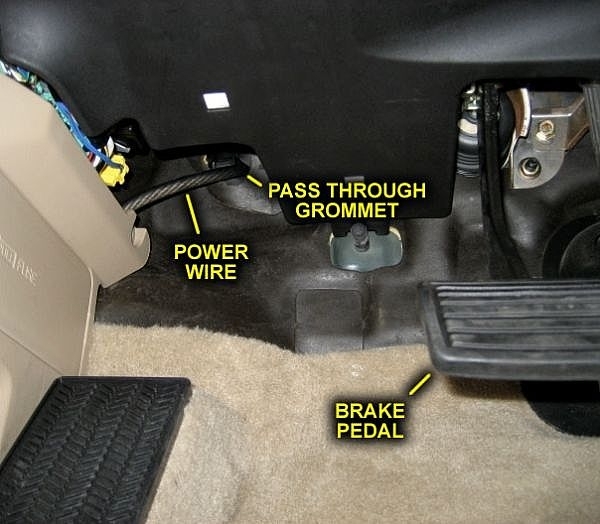 Generally, a good place for routing the power wire is along the drivers side edge of the carpet. This is usually held on with plastic fasteners that can easily be pried loose and refastened. Removing the rear seat will also give easy access to the trunk. 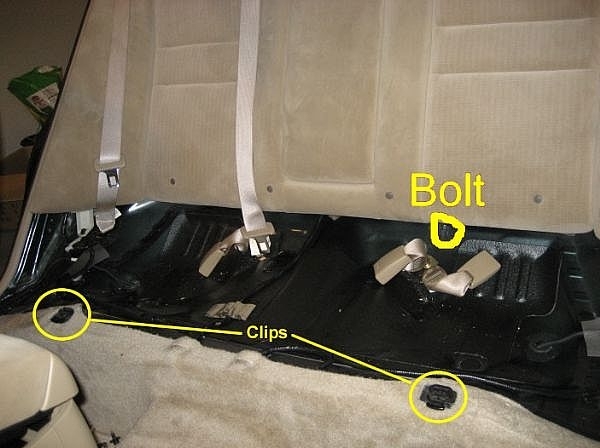 The rear seat is usually held in place with two clips that are located under each 'bucket' seat. Sometimes there is also a bolt the holds the seat in place. Gain access to your aftermarket CD receiver or stereo headunit with RCA outputs and remote wire hookup. Once you have access, connect your RCA cables to the Subwoofer Output (SUB OUT) and also attach the remote turn on wire to the 'RMT' or 'REMOTE' wire on your CD headunit (usually a blue wire). Run these wires back to the trunk to the amplifier location as you did with the power wire. To prevent noise from entering the system, run signal and speaker wires down the passenger side of the vehicle and keep them separate from the power wire. Connect the Power Wire to the '+12V' or 'PWR' connection terminal on your amplifier, connect the remote turn on wire to the 'RMT' or 'REMOTE' connection terminal on the amp, and also connect the RCA connectors to the RCA Input on your amp. Crimp a ring terminal to one end of your ground wire. Find an existing bolt in your trunk that you can attach the ground wire ring terminal to. 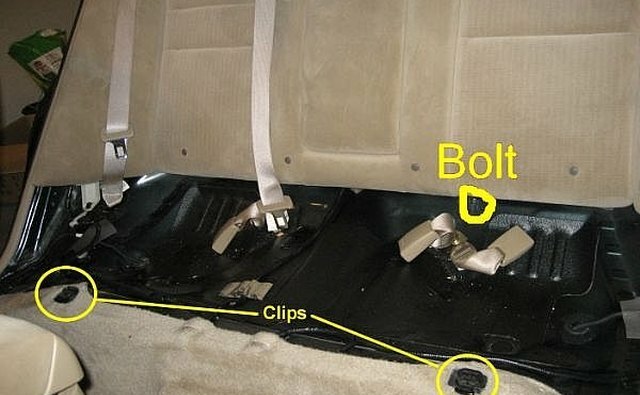 If one does not exist, find an area that will be covered by carpet where you can drill a whole and place your own bolt. Be sure to scrape away some of the paint to achieve good conductivity for the ground wire. Now, attach the ground wire to the 'GND' or 'Ground' connection terminal of your amplifier. Connect the subwoofer to the amplifier with your speaker wire. Make sure that the positive (+) terminal on the subwoofer is connected to the positive (+) terminal on the amplifier or your subwoofer will be out of phase 180º. Now, reconnect the negative terminal of your battery and check to see that the amplifier turns on and that the subwoofer is audible. Once you have ensured that everything is properly connected, reassemble your car and enjoy the bump! When choosing your power, ground, and speaker wire, make sure that you are using a gauge of wire which is suitable for the amount of power that it will be delivering. Select a fuse that will be only slightly larger than the current that your system intends to draw. Selecting a fuse that is far too large can cause the wire to heat up and cause melted insulation and possibly catch fire. Anytime your are working with electricity there is always the potential for danger. 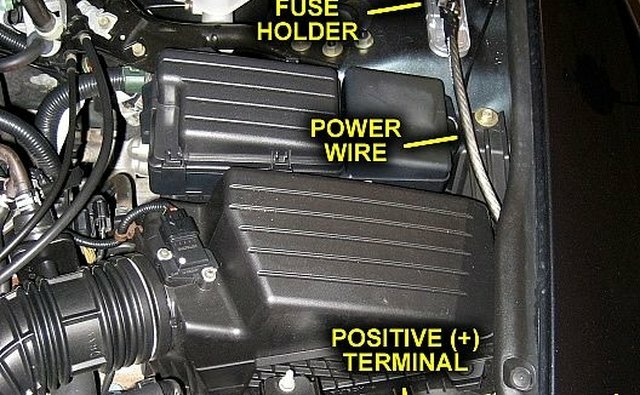 Make certain that the negative terminal of the battery is disconnected while working on anything electronic with your vehicle. This will prevent a lot of accidents.